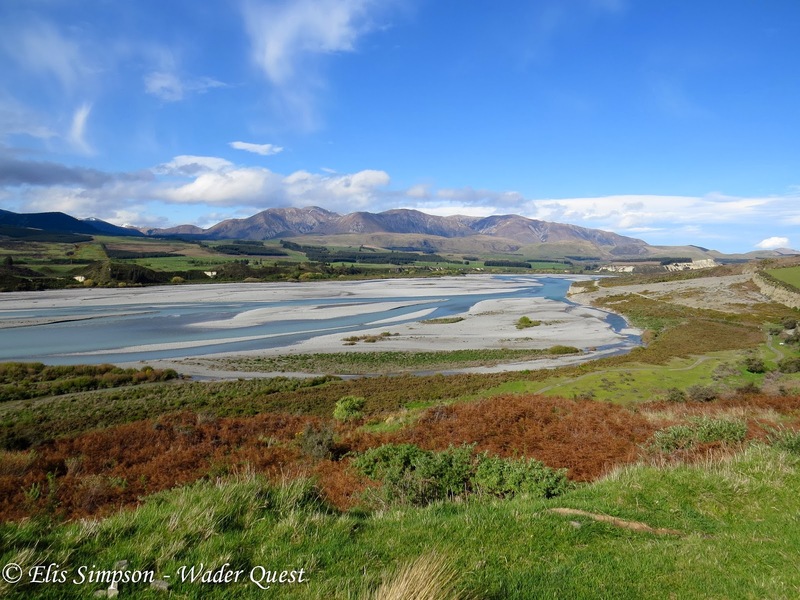 Wader Quest: A look back at New Zealand! A look back at New Zealand! We didn't cover New Zealand on this blog very well when we were there due to a difficulty in connecting to the internet wherever we went. After the trip we had precious little time before heading for Brazil and Chile, so here is a belated summary. 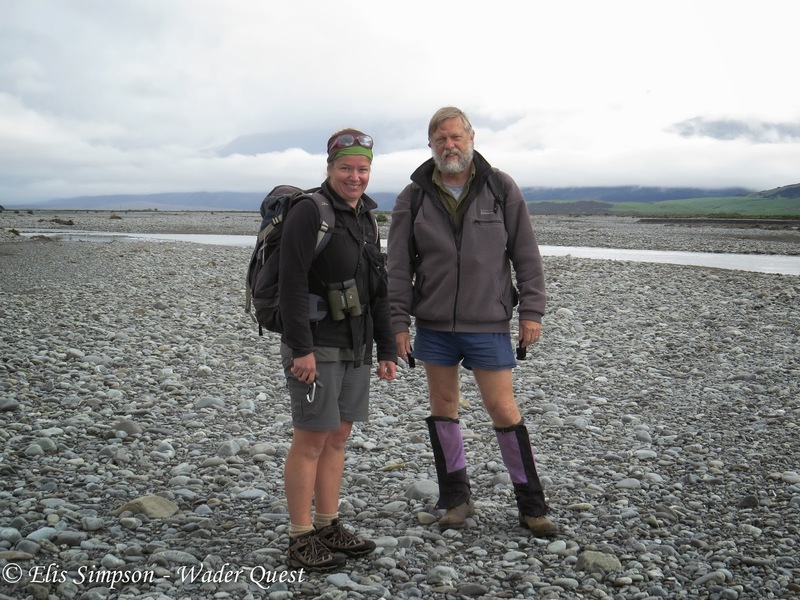 We arrived in New Zealand with 149 species on the Wader Quest list. We were very lucky to have had the help advice of John Dowding and we also enjoyed his company in the field on one day a gentleman who has done so much to forward the protection and conservation of shorebirds and their habitats in New Zealand. 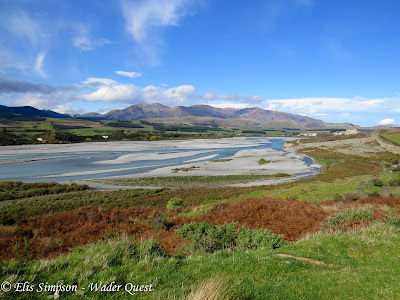 Classic braided River, Rakaia River, South Island, New Zealand. Our very first day resulted in us gaining four new species, and what species they were too: South Island Pied Oystercatcher, Double-banded Plover, Black Stilt and Wrybill! The oystercatchers we came across as we drove from Christchurch to Twizel near the mountains, we stopped the car in a hurry when we spotted them in a roadside field. South Island Pied Oystercatcher Haematopus finschi. Hybrid White-headed & Black Stilts Himantopus leucocephalus/novaezelandiae; Lake Tekapo, South Island, New Zealand. but the disappointment was very much diminished by the finding of a Double-banded Plover very close to the car. Double-banded Plover Charadrius bicinctus; Lake Tekapo, South Island, New Zealand. Undeterred we carried on looking for the Black Stilts and eventually came across two at Lake McGregor, just as we were leaving! These were proper, dark birds, but as we watched them come closer they revealed some white feathering around the face, on the belly and undertail coverts. This worried me a little, were they hybrids too ? Black Stilts Himantopus novaezelandiae; Lake McGregor, South Island, Newzeland. We decided we should try and find more to be sure and shortly afterwards we arrived at Glentanner. There we saw a lady whose name turned out to be Femme, feeding a number of recently released Black Stilts. 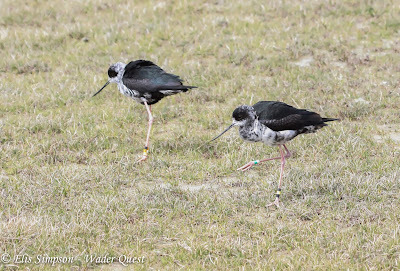 Recently released Black Stilts; Glentanner, South Island, New Zealand. It was great to see them so close. 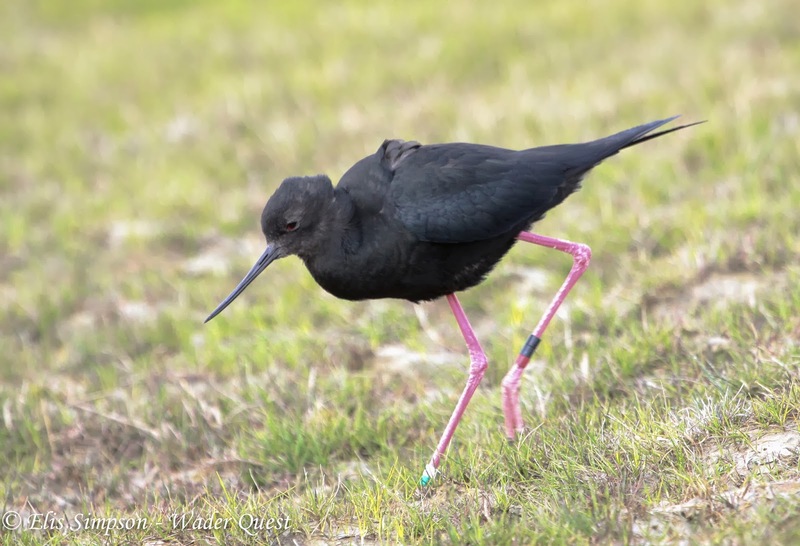 We asked Femme about our previous Black Stilts and, upon inspecting the photos Elis had taken, she confirmed that they were indeed full Black Stilts, determined not by any plumage detail, but by the rings on their legs! 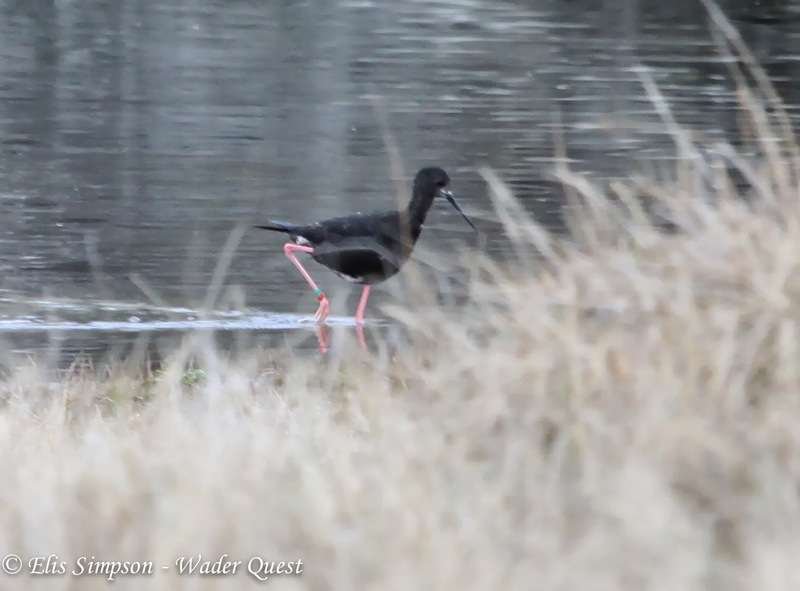 Black Stilt; the tell tale leg rings clearly visible, phew! With the juvenile Black Stilts we noticed an adult, Femme explained that this was a bird that had resisted the urge to 'disperse' possibly influenced by the occasional free hand out of food and the fact that young females were presented to him from time to time. no fool this bird! 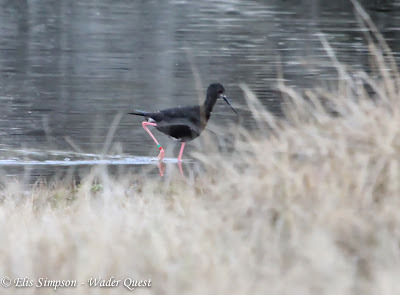 Adult Black Stilt at Glentanner. 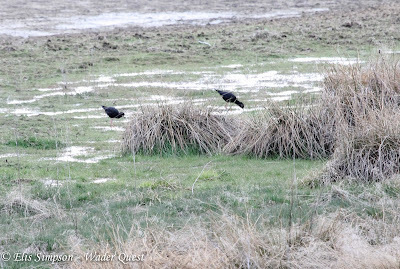 We asked Femme about Wrybills and were disappointed to hear that they usually kept to the middle of the braided river system and, as we were not inclined to get our feet wet, we may not see them. Nevertheless, Elis and I decided to have a walk along the near edge of the river just in case. It turned out to be a good decision as we soon came across a pair feeding at the water's edge. Female Wrybill Anarhynchus frontalis; Glentanner, South Island New Zealand. 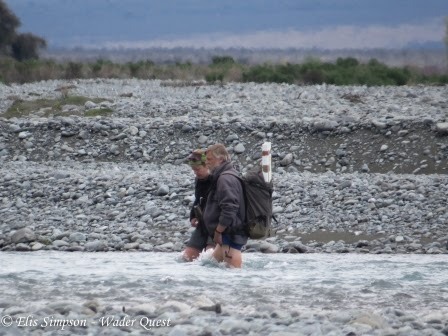 A couple of days later we had a day out ringing more Wrybills with John and Antje Leseberg, a day we will not soon forget, not just for the chance to see Wrybills close up, and hold them into the bargain, but also for the experience of wading through water that hadn't that long ago been part of a glacier! 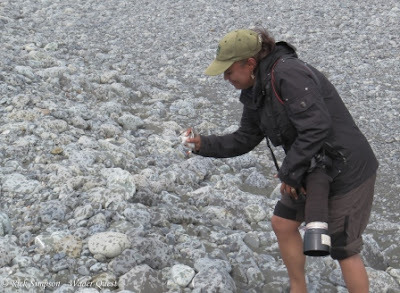 Anje and John; Rakaia River, South Island, New Zealand. 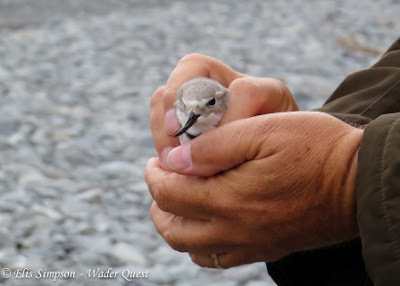 Wrybill in the hand... my hand! Elis releasing a Wrybill after ringing. Ex glacier water! Note we did not wade as deep as these brave souls! 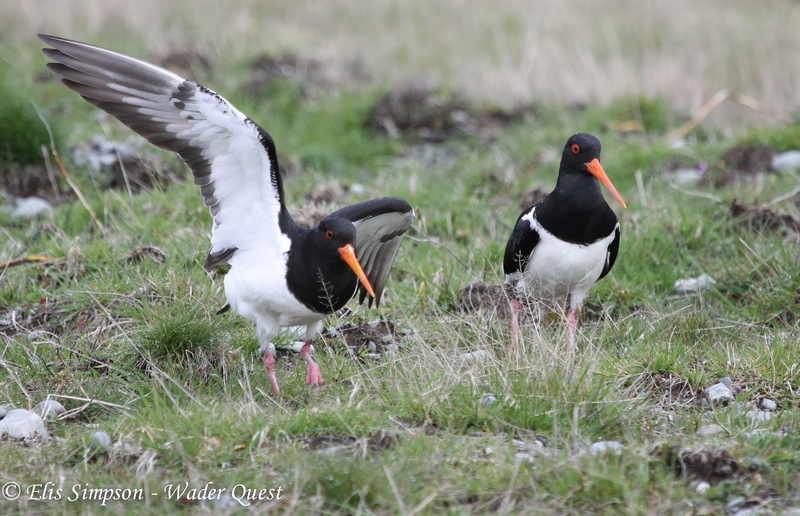 All in the cause of wader conservation, heroes in our opinion! 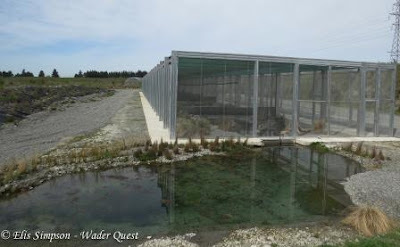 The captive breeding enclosures: Shore Plover in the foreground, Black Stilt behind. We thought this may be the only opportunity we'd have to see any Shore Plovers so we enjoyed getting very close to them. Captive Shore Plover Thinornis novaeseelandiae; Peacock Springs captive breeding centre, New Zealand. 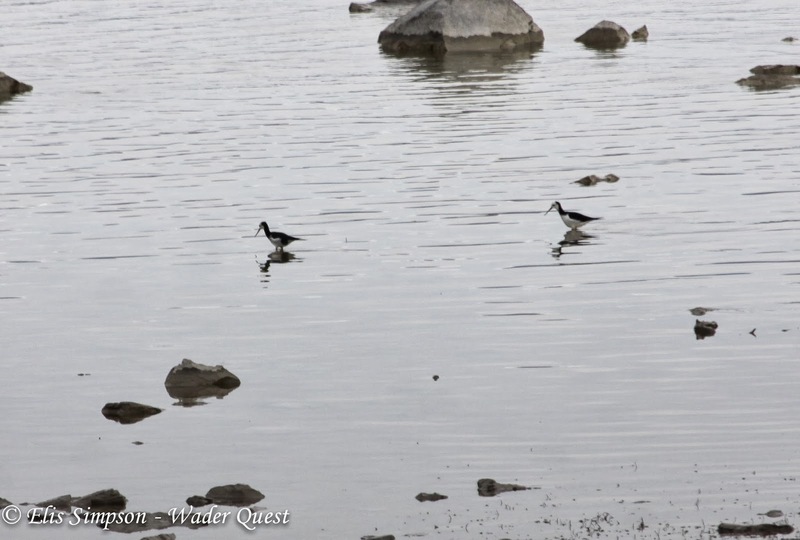 Elis got this photograph of a pair of Black Stilts mating, apparently this is quite rare! Captive Black Stilts Himantopus novaezelandiae; Photographed descreetly from behind a grass tuft! 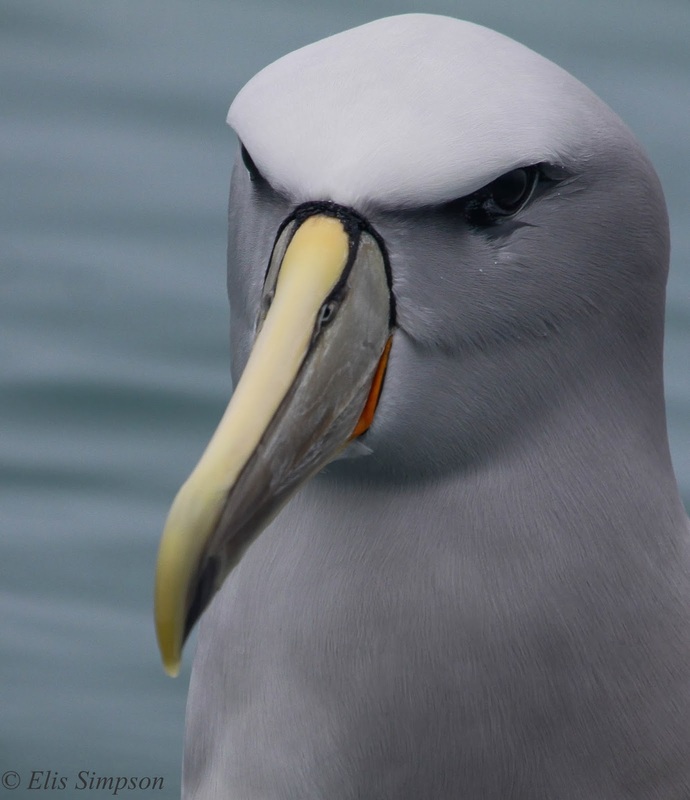 We had a day off to go on pelagic trip out of Kaikoura which was utterly fantastic, five species of albatross around our little boat. 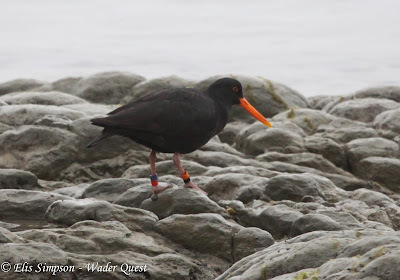 Even though it was a day off we still managed to find a new Wader Quest bird: Variable Oystercatcher, on the rocky beach at Kaikoura. Variable Oystercatcher Haematopus unicolor; Kaikoura, South Island, New Zealand. The North Island proved a little frustrating at first as we tried to get to Mana Island to see the Shore Plovers there at the release site. The price of the passage was too high for us to contemplate. So we moved on thinking our chance to see this species free-flying had gone. We moved on to the Manawatu Estuary region at Foxton. Here we were helped immesuarbly by the kindness of Craig Steed. Craig organised accommodation for us and also arranged for us to give a talk in Palmerston North which we greatly enjoyed and which provided us with some more funds for our projects. 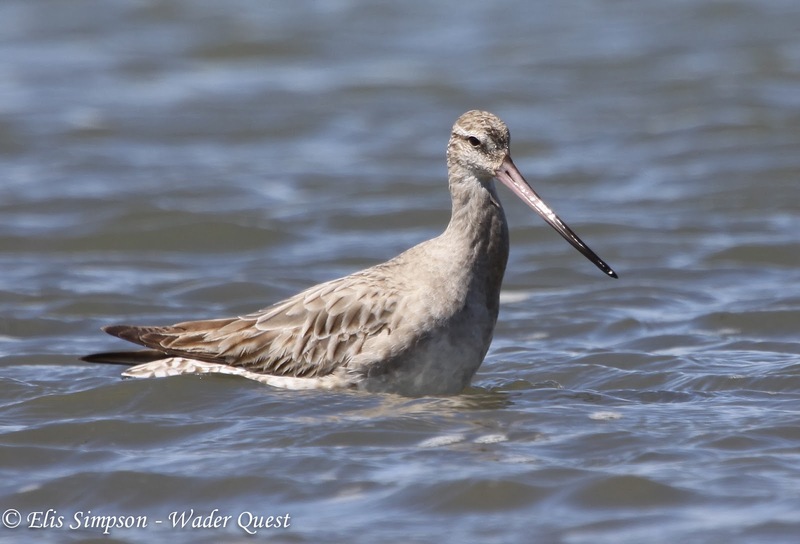 We also met Phil Battley who has been studying the famous long-distance record holding Bar-tailed Godwits that migrate 11,000km non-stop from Alaska to New Zealand. Bar-tailed Godwit Limosa lapponica baueri; long-distance migrant from Alaska, Manawatu Estuary, North Island, New Zealand. Phil Battley explaining his reseach on Foxton Beach. This bird had recently arrived having flown 11,000kms non-stop from Alaska. 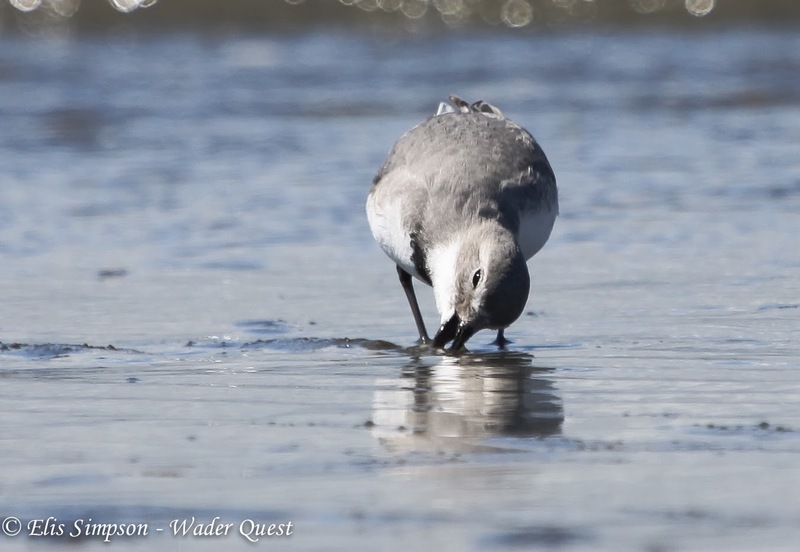 We also saw more Wrybills here, this time on mud and were amused to see that they often fed by turning their head in the same way that they do when searching for food under rocks. Wrybill; turning head to the side to feed even in mud! No new species were added there and we left the area joining Brent Stephenson and Sav Saville of Wrybill Tours for a twitch north to see Oriental Plover at Port Waikato. A successful trip which resulted in a lifer for the boys and also for us in the form of New Zealand Dotterel. Oriental Plover Charadrius veredus; Port Waikato, North Island, New Zealand. Our first New Zealand Dotterels Charadrius obscurus; Port Waikato, North Island, New Zealand. We were now very close to Miranda Shorebird Centre where we stayed for the remainder of the trip. 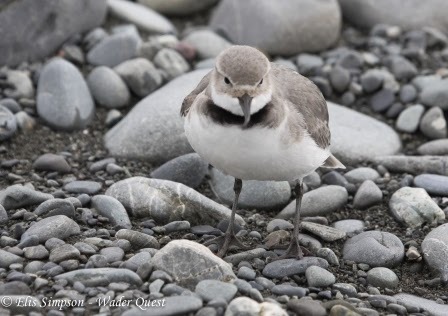 During this time we had the chance to twitch a Shore Plover at Point England in Aukland, information first given to us by John Dowding and confrmed by David Lawrie at Miranda. We came across this bird after we had given up any hope of seeing it when it flew towards Elis as she was photographing these New Zealand Dotterels! New Zealand Dotterels; Point England, Auckland, North Island, New Zealand. 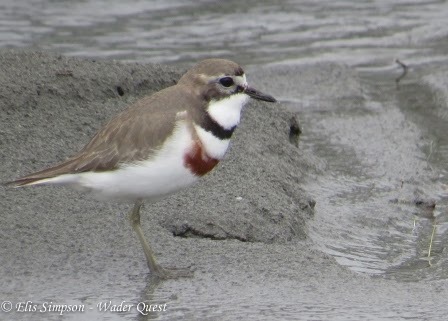 Shore Plover; Point England, Auckland, North Island, New Zealand. We also gave another talk at Miranda raising even more funds, we were very well looked after by manager Keith Woodley and enjoyed the company of David Lawrie, Adrian Reigen and Ann and Ray Buckmaster and other members on the Sunday, the day of the talk. My most memorable part of the day however was being asked what I had done in the war (WWII)! I know I'm looking a bit the worse for wear these days, but honestly? Holding forth at the Miranda Shorebird Centre. Thanks David. Coming to New Zealand was definitely one of the highlights of our year thanks largely to your input in the organisation before we came. I hope we can continue to make you jealous (in the nicest possible way) with photos still to come. It was great to meet you in person at Miranda after all the exchanged emails on the run uo to the trip and like you I hope that our next meeting be sooner rather than later. Rick and Elis.